Hitting UK shelves in January 2018, the SuperZings are everyday objects brought to life in a comical hero vs. villain theme. There are more than 80 multi-coloured characters to collect, each with a matching rival. All living together in Kaboom City, there are 36 regular characters available in two different colour-themes, plus six Silver and two Gold Rare and One Enigma Super Rare SuperZing. The figures all have their own superpower and profile, use collectible Supercars to get around (eight to collect), and live in Hideouts (eight to collect) which can also be used to launch the characters into the air. SuperZings Series 1 is being supported by a full 360 marketing campaign including TV, digital, Social Media, Unboxings with influencers (Video here), PR and webisodes to introduce the characters and their rivalries. 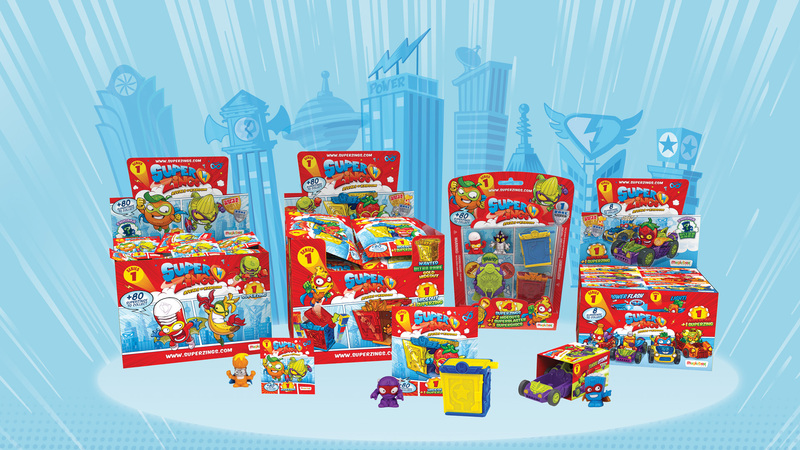 The core collectable range includes Blind bags containing one SuperZing, hideouts including one SuperZing (eight to collect), and Supercars including one SuperZing (eight to collect). There is also a Starter Pack, plus a Blister Pack containing four SuperZings, two Hideouts and an exclusive SuperDisc Blaster. In addition, there’s an even wider range of toys for fans to expand their collection, such as the Kaboom Trap to imprison villains, which comes with two exclusive SuperZings and a Mission Pack. With 2 Series launches per year and an estimated minimum RSV (Retail Sales Value) of £10 Million, it is an exciting time to get on board the Superzing licencing program! Click here to learn more about the Superzings!